Notes: That means only run the 800 meters once at the beginning and once at the end! Conditioning Bias options will be available in class! 1. Nutrition – Like McCoy mentioned yesterday, nutrition is everything. For 3 to 4 weeks leading up to PR week, I went strict Paleo/Zone-ish (did not weigh and measure). I had been on Paleo + Dairy for several months because of Outlaw and saw outstanding gains in size and strength and power, but I caught a cold and stopped the dairy. Since I stopped the dairy, I also figured I would stop grains, and wheat, and all processed foods. I’m second to no man when it comes to love of chocolate and desserts, but Badger had told me she was going to wait until the Comp to destrominate some ice cream and goddammit I was going to wait with her too. After about 4 days clean I couldn’t believe how great and light and strong I felt. It turned out I just kept going clean because it felt so great and didn’t want to stop. After a while I didn’t even crave my beloved desserts like I used to. So in the last 5 1/2 weeks I’ve cheated maybe 6 times, and each time was an emotional/psychological craving versus a physiological one. 2. Attacking weaknesses – It’s been said before that if you attack your weaknesses in CrossFit, everything else becomes better. I was taught that attacking your weaknesses will do more for your fitness and improve your numbers in ways that do not make sense mechanically or metabolically. It’s happened to me (and countless others) many times, but it’s SO HARD TO BELIEVE. It’s so counter intuitive and unnatural. But sure enough there I was attacking metcons, my one true weakness like a madman, and only doing it because my dumbass lost a bet against Cara Cooney (thanks a lot Cara!) But, here’s the terrifying thing, I lost weight but PR’d in the Split Jerk by almost 25 lbs, PR’d in the Back Squat by 50 (!) lbs, and PR’d in everything, everyday, all week long. It didn’t make sense, it doesn’t still, but I’m going with it. Attack your weaknesses people. 3. Rest/taper??? The week before I only worked out twice. Tweaked my elbow at the comp and just rested myself. I was eager to get back to training but it just turned out that it was PR testing week, and I was fully rested. Something to consider . . .
4. Programming – No doubt about it, Outlaw has you snatching and clean and jerking and squatting and jumping at intensities and volumes to confound the imagination. I only ever did the full weeks programming ONCE in the entire time I’ve begun; it’s that hard. But I cannot argue with the data if you keep experimenting and tweaking your stuff accordingly to your own needs. 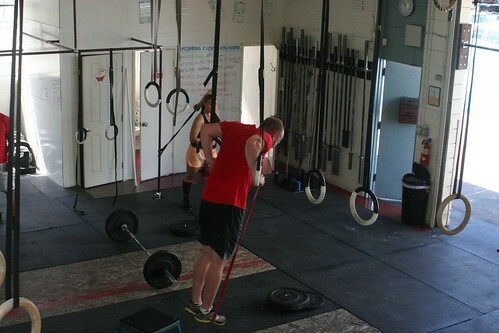 That’s why CrossFit, and by extension our box, is so awesome. Nerdier reading: “An Answer,” by CrossFit Chief Scientist, Dr. J.A. Glassman, presents a thorough, evidence-based response to the unsubstantiated claims made in the Consensus Paper on Extreme Conditioning Programs in Military Personnel by the Consortium for Health and Military Performance (CHAMP) and the American College of Sports Medicine (ACSM).